Things that are good to know... the first time around. My eldest daughter is a passionate person, and she loves me passionately. It’s a sweet-sounding statement, I know, but the reality is that it is also overwhelming. Although she is the opposite of a wallflower when out in the world and away from me, if given the option, she’d like to be physically attached to me 24-7. She pushes her little sister out of the way to get the first hug every time I come in the door. She kisses me with more force than is comfortable. I have spent two years of preschool and a year of kindergarten peeling her off my body each day to get her into the door. “Oh, that’s so nice,” another mom said to me, smiling kindly, after one of these intense drop-off sessions in the hallway. “Enjoy it while it lasts.” And I do try, but here’s my confession: sometimes I don’t enjoy it at all. Don’t get me wrong, of course her passion is part of what I love about her. But sometimes it drives me crazy. If you’ve ever had one of those borderline-desperate teenage boyfriends who hangs around more than he should, you know that being loved so intensely can be both flattering and suffocating. The difference with kids, of course, is that breaking up is not an option. You can’t give them the “It’s not you, it’s me” speech or tell them to take a hike. Instead, you must learn to navigate the tidal wave of emotion they send your way, to weather the weight of that constant need, without crushing their spirit in the process. 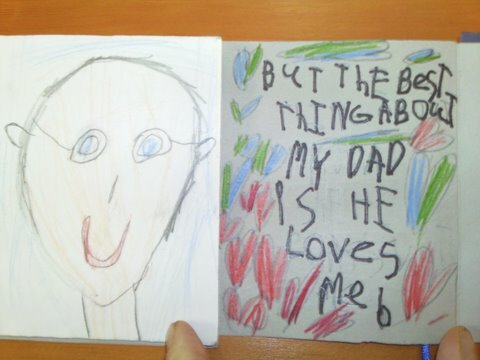 Would I have chosen to have such a passionate kid? I’m not sure. But that’s what I got. 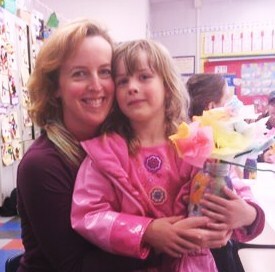 Someday, I know, this six-year-old of mine will be fourteen and her fervor for me will wane. In fact, she may refuse to let me near her. That concept is hard to fathom. Will she honestly not be underfoot every time I turn around? Not want to lay on top of me when we watch a movie? Not care if she gets the first hug any more, or whether I’m the one who picks her up after school today? You more experienced parents know the answer, and in my heart, so do I. So what do I do? I try to remember that during these very early years, I’m helping her become who she’s meant to be, and that her ardent nature helps define her. I try to think of what exciting things she might do in the world, once her passion is not so tightly tied to me. I do my best to be generous with this person who loves me madly and unconditionally, offering her my affection, my reassurance, and those constant hugs and kisses, even when I’m not totally in the mood to give them. Because I know there are times when I need all of that from her, too…and in those moments, I should be thankful I’ve got–for now–an unlimited supply. This month, Seattle Magazine features my new book, Mama’s Big Book of Little Lifesavers. So pleased that both my kitchen and me look clean and presentable, which is not normally the case. Success! (And of course, I wouldn’t be doing my job if I didn’t say: the book is perfect any moms on your holiday list! It’s available on amazon or from my alma mater, Chronicle Books.) Enjoy. A local mom has published a helpful guide for preserving time, energy and money while parenting. Ballard mom and publishing consultant Kerry Colburn has a knack for dispensing the kind of useful, no-nonsense advice that every parent wants and needs. 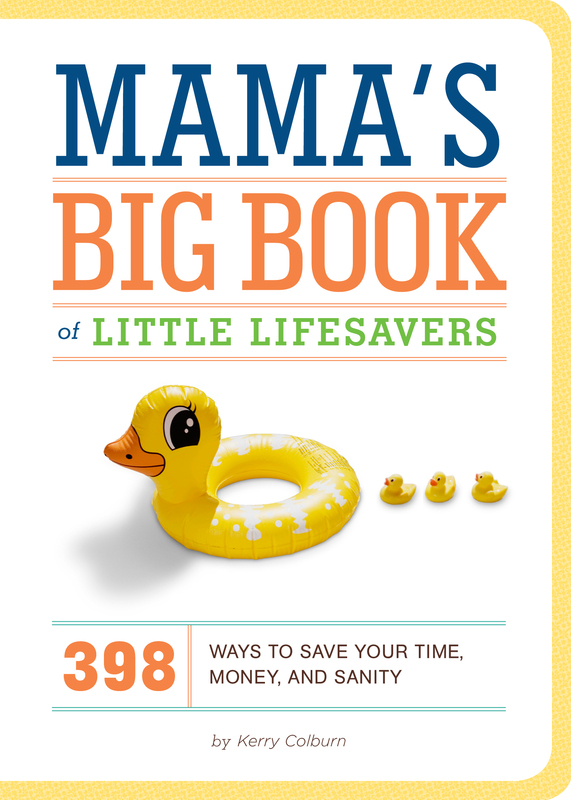 Her newest book,Mama’s Big Book of Little Lifesavers: 398 Ways to Save Your Time, Money, and Sanity(Chronicle Books, $14.95), published this past April, is an easy stocking stuffer for the moms and dads on your list, and offers a big assist with sage tips, including a few for navigating the holiday season. TIP #1: Want a good place to hide Santa’s gifts from curious kids? Zip them up inside stored luggage. TIP #2: Start a tradition: For every item on a child’s Christmas list, one old toy (or more!) must be donated to someone in need. TIP #3: Find a good sale? Stock up on extras of a favorite toy, book or doll. Keep these on hand for birthday parties for the rest of the year and skip the last-minute run-around. Hope you enjoy my new column from this month’s Seattle’s Child. Would love to hear what traditions you’re starting with your family this year–big or small! Last Christmas, my five-year-old had exactly three things on her list for Santa: a diary, a set of jacks, and a Pillow Pet. I did a very quick 180 that day, and it got me thinking about how I present the idea of the holidays to my kids. Suddenly, I saw what an opportunity I had in front of me. With a new or young family, Christmas is a clean slate. My five- and two-year-old girls, for example, had no lofty expectations of how many gifts they would receive, nor did they have set ideas of what our activities should be. They didn’t even know what Christmas dinner ought to be! What they were excited about was the ideaof Christmas – colored lights, time off from school, treats, the chance of snow, Santa on the roof. Did it matter to them whether their gifts totaled $30 or $300, whether we went to big-ticket performances or a neighborhood puppet show? Not in the slightest. It was up to me to show them what the holidays look like for our family. It’s time to take advantage of this, people. For many of us, becoming parents means that for the first time, we get to start our own traditions in our own houses. Even if we’ve flown home to the east coast all of our lives, when babies come, we often get a free pass to nest with our own family and do our own thing. Finally, we can have lasagna and martinis for Christmas dinner if we want, and no one will be the wiser! We can watch Christmas Vacation instead of It’s a Wonderful Life! Halleluiah! It’s funny, then, how we often find ourselves simply repeating the familiar traditions we grew up with – even those we don’t like. “The formal Christmas dinner was always stressful at my house, growing up,” shares a dad I know. “It was my least favorite thing as a kid. Yet somehow, I instigated it myself because it seemed like what I was supposed to do once I had a family.” After killing themselves by pulling this off with a newborn, the next year they started their own tradition: a self-serve potluck lunch and a batch of Bloody Marys, which allowed for more mingling and less prep and clean-up. It’s now a Christmas day tradition at their house, and their whole family loves it. My advice to you this year is to take a moment to think about what memories are most meaningful for you and your partner, and to talk about what you want the holidays to be, for you and for your kids. You might settle on some small things, like a cookie-making party with your neighbors, or bigger ones, like working at a soup kitchen on Christmas Eve. The important thing is that you put intention behind it, and realize that you have a rare opportunity to start annual rituals that your kids will look forward to … at least until they have their own kids and decide to change everything. Here are some ideas I’m working toward this year. I’d love to hear yours. Shop local – Hit our many wonderful craft fairs and neighborhood stores, and if it’s age-appropriate, involve your child in choosing gifts for others. It beats schlepping the kids to a big shopping center any day. Introduce charity – Involve your kids in the concept of giving, from picking a needy child’s name off a tree to weeding out toys to donate. A friend of mine takes her kids and their red wagon around her block every year to gather food bank donations from neighboring houses. Get together – Start simple, homespun traditions that gather friends or neighbors, like cookie decorating, making snowflakes for the windows, or having a progressive party. Get creative – Save money on wrap, cards, and décor by having your children decorate butcher paper with markers and glitter that you probably already have on hand. It’s an activity and a money-saver – plus your kids will be proud and the recipients charmed. Experience gifts – In lieu of an expensive present, choose a shared experience that involves time together, like a ski trip, a membership to the aquarium, or theater tickets. Love it or hate it, a new school year is starting. In honor of the season of Trapper Keepers, #2 pencils, new shoes, and teary goodbyes, here’s my new column for Seattle’s Child. I have to say, it was hard to argue. We believe in lax, unscheduled summers for our kids and I work less for those months, so we get into a nice rhythm of picnics, parks, and pajamas worn past noon. Then suddenly, it’s that time of year again, when all the backpacks in the universe land in the front of stores with a resounding thud. No more lazy popsicle days in the backyard; it’s time for alarm clocks, homework, and yes, hustle-and-bustle. No matter who you are, where you live, or what kind of parent you imagine yourself to be (helicopter, free range, or something in between), there is one great leveler that hits us all in the gut in the same way. I’m referring, of course, to the day your first child starts kindergarten. It doesn’t matter whether your child has been in full-time daycare since infancy, went to years of preschool, or has never left your side, the start of “real school” is a major milestone, fraught with emotion for everyone. Even if you have honestly longed for this day, something happens when you see your child heading out with a huge backpack, new shoes, and a lunchbox: you can’t help but picture the baby you rocked in your arms, the toddler who stripped her clothes off in public places, the preschooler who put marbles in his nose. How did your child become so grown up? And how have you gone from total novice to kindergarten parent? When my daughter took the plunge, even though she had had three years of preschool, it was akin to watching her learn to walk. Suddenly, she was moving away from me and toward something else. And just like with those first toddling steps, a million little steps followed in quick succession as the year progressed. Drop-offs that had been painfully dramatic got less so. Physical feats were tackled in short order: scooter, monkey bars, jump rope. Letters that were previously jumbled all over the page suddenly began to form (relatively) straight lines. Friends were made. My daughter began telling funny stories, described favorite parts of the day, and proudly showed me the way to the cafeteria, library, and office by herself. Remember, some kids take to kindergarten like fish to water, others take longer to adjust and need more support along the way. The same goes for the parents. No matter how you feel when the classroom door shuts on that first day – elated, free, nostalgic, lonely, excited, blue – it’s okay. This is but one of many big moments yet to come, and you’re doing a beautiful job. After all, you’ve raised a kindergartener! 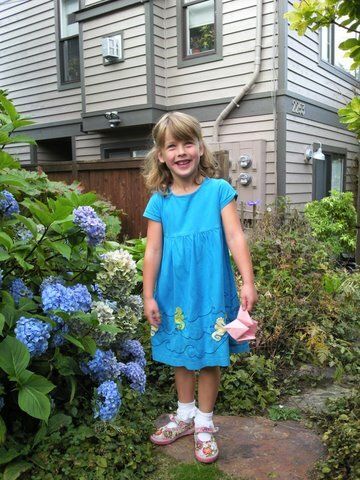 What was the transition to kindergarten like for your family? We’d love to hear about it! Reading this card made me, once again, grateful for the setup at our house, where we are all under each other’s noses, almost all the time. We are two parents who work from home with two kids under six, so our house (and the dishwasher) is always full and dad is around almost as much as mom. (When I tell the girls that some dads leave the house before the kids wake up and work in office buildings downtown, I get blank, uncomprehending stares.) Sure, this lifestyle has its ups and downs. There are times when both of us are desperate to go to a nice civilized office for a few hours, wearing grown-up clothes. But mostly, we feel unbelievably lucky. No matter what the situation at your house, it’s important to give dad as much opportunity as mom to navigate life with the kid(s). It’s the only way to ensure you are all in this magical, sticky, frustrating, eye-opening world together. We’ve all seen how easy is to for new moms to slide into doing everything themselves, because they feel they know best. So they micromanage. They over-explain. They constantly check in when dad is in charge. And somewhere along the way, they shoot themselves in the foot. Moms, chances are that partner you’ve chosen for this unpredictable path of parenthood is fun, smart, loving, and perfectly capable of wiggling his way out of any parenting jam. Give him the freedom to find his own way, and every member of the family benefits. Hope you’ll weigh in on my Father’s Day column for Seattle’s Child! Hmm. So, dad checks out with a beer and mom is on deck, night after night. And worse, Jacob and dad never learn to find their own way to a fun bath time, guy style. That’s a shame. Who among us has made these sorts of comments to the dad of your house this week? Not that binky, the other one! You’re holding her the wrong way. You’re bouncing him too much; he’ll throw up! That’s not how she likes her pasta. Are you taking her out in that? Oh, never mind, I’ll just do it. When does this micromanagement of dads begin? Perhaps in the newborn months, when mom is often the primary caregiver of what seems to be a very fragile little being. Hormones and worry combine to up the ante, and we can become convinced that we know not just the best way, but the only way, to care for our child. All understandable. But keeping that pattern into toddlerhood, early childhood, and beyond is not the way to go. It can cause resentment and frustration, and in the end it only defeats the purpose of having dad do his share – and reap the rewards of time spent on his own with his child. After all, don’t we all want more engagement from our partners, and a child who doesn’t expect everything to be done exactly as mom would? Don’t we? Yet somehow, we can resist releasing that control. The irony? After lecturing him on how the diaper was on too tight, she had to eat crow when he explained that the diaper she was criticizing hadn’t even been changed yet – so it was the diaper that she put on that was supposedly unacceptable. Listen up, moms: Let go a little. Give dad some freedom to do things his way. Bite your tongue and let him discover a new technique to swaddle the baby, get peas into your toddler’s mouth, or comb your kindergartener’s hair. Let him feel both the joy of success (shoes and socks on!) and the pain of defeat (she won’t nap!). You both deserve that – and so do your kids. This doesn’t mean you can’t help out your spouse by explaining lessons you’ve learned by trial and error with your child- – something he maybe hasn’t had as much of if he’s been away more than you. But as with any unsolicited advice, there’s a wrong way (“Don’t just dump water on his head! He hates that! You’ll get soap in his eyes! Why is it so cold in here?”) and a right way. The wrong way can quickly become an excuse for a frustrated dad to give up and let mom do it. That isn’t a desirable result for anyone. So, if your suggestion isn’t an immediate safety imperative, hold your comments. Later, if there’s something you truly think you can help with, wait for a good moment and finesse your delivery. If your spouse had a hard time doing the bath his way, for example, try phrasing your advice like this: “I really struggle getting Sally’s hair washed, too. It’s not easy. Do you know what I found has worked this week? I hold a toy really high over my head – then when she looks up I rinse her hair with my other hand.” My guess is that an approach like that will go over a lot better than bursting into the bathroom at the first sound of crying and demanding to know what’s going on. But beyond that, it’s important to show the dad in your life that you not only trust him, but you admire his skills. Did he manage tickle your daughter out of a tantrum? Have a blast taking the kids to Home Depot in their PJs? Find a way to make cauliflower edible? Give him his props. He deserves it. Let dad sing different songs, soothe in his own way, and play games that would never cross your mind. Basically, let him be truly in charge sometimes, without your input. Repeat after me: This is what you want. You may even find that once you let yourself stand back a little, you learn some new tips and tricks to use yourself. I was p leased as punch to see a great piece on Mama’s Big Book of Little Lifesavers in the Chicago Tribune today–and I love the tips she included! Check out the article here. Also, if you’re in Seattle, I hope you’ll stop by my event on Thursday, May 19, from 3:30-5:30pm at Twirl Cafe on Queen Anne Avenue, brought to you by Queen Anne Books. Kids can play for free in their awesome play space, and mamas can enjoy some drink specials. Win-win! Oh, and I’ll be signing books, too. More info can be found here. 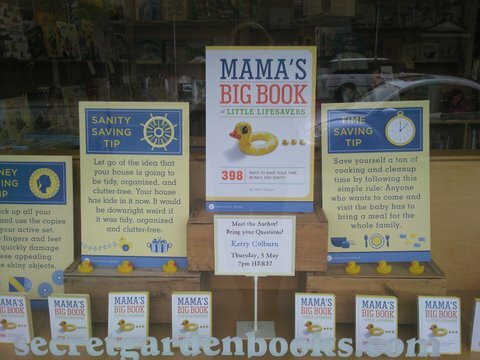 It’s Mom’s Day week and my new book, Mama’s Big Book of Little Lifesavers, is on the shelves coast to coast! Here’s hoping it helps moms everywhere find some new time-savers, money-savers, or (perhaps most important) sanity-savers. I’ve always wanted a cheat sheet from other moms, a chance to sneak a peek into their houses to figure out what works for them–and what doesn’t. This book comes pretty close to that goal. Moms from all over the country told me what makes their lives just a little bit easier, and I’ve wrapped it all up into this cute little package (with thanks to Chronicle Books)! I’d also like to give a big shout-out to my neighborhood indie bookstore, Secret Garden Books, for giving me this awesome window display! If you’re in Seattle, swing by the launch party on May 5 at 7pm. Bring the kids, have a cupcake, and enter to win free books. Thanks for all the support!